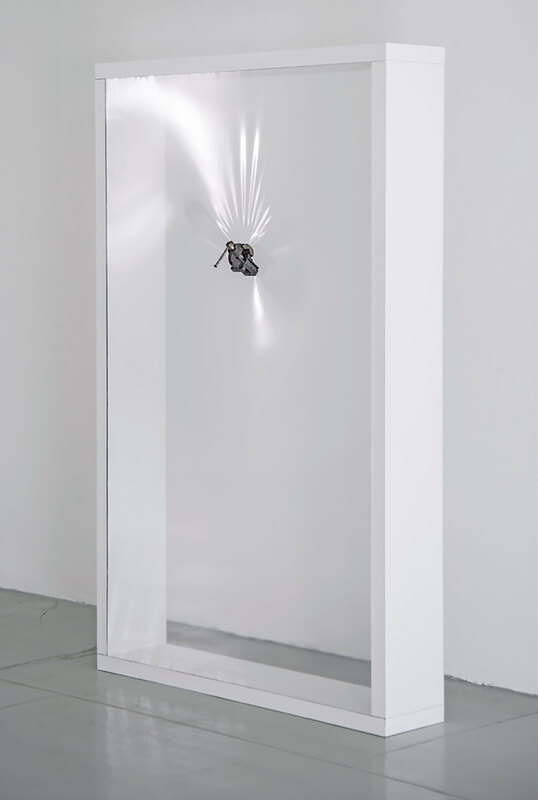 Giovanni Anselmo, Untitled, 1967, wood, Formica, polyethylene, vise, 74 7⁄8 × 47 1⁄4 × 9 7⁄8". Giovanni Anselmo’s recent exhibition “Mentre i disegni misurano, la luce focalizza, i colori e le pietre sono peso vivo” (While Drawings Measure, Light Focuses, Colors and Stones Are Living Weight) took its title directly from works by the Arte Povera artist on view in the first room of the gallery. The series “Mentre i disegni misurano,” created over the course of a decade beginning in 1969, consists of eighteen sheets of drawing paper entirely covered in gray graphite. The artist sees these as details, on a one-to-one scale, of the word infinito (infinity), imagined as infinitely large. The small gray rectangles, understood as fragments of something incomprehensibly vast brought back to the human dimension, here measured the actual space by being placed at regular intervals on two opposite walls.